Mumbai: Options traders are the most bearish on Infosys Ltd in seven months on speculation that India’s second biggest software maker may cut its earnings forecast on Wednesday amid uncertainties in the global economy. Infosys has dropped 27% this year, compared with a 19% slide in the BSE’s benchmark Sensex, on concerns customers are holding off on new contracts amid the global market turmoil. 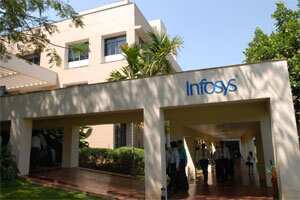 Europe and North America accounted for nearly 87% of Infosys’s sales in the year ended 31 March. “When the US and Europe are not doing that great, some cut in earnings forecast is likely to happen," Jagannadham Thunuguntla, chief strategist at New Delhi-based SMC Wealth Management Services Ltd, told Bloomberg on Tuesday. “They will probably give an indication of a bearish outlook, with clients cutting their information technology spending." Infosys in July forecast sales in the year ending March to range from $7.1 billion to $7.3 billion, less than the $7.5 billion average of 56 analysts estimates compiled by Bloomberg. The Bangalore-based company may say on Wednesday that profit rose to ₹ 1,880 crore in the quarter ended September, from ₹ 1,740 crore a year ago, according to the median estimate of 28 analysts surveyed by Bloomberg. “I think that the cut in US dollar guidance won’t be beyond 150 basis points (bps); of that, 110 points will be from the change in the dollar against the euro, Australian dollar and the pound," said Pralay Kumar Das, an analyst at Mumbai-based Elara Securities (India) Pvt. Ltd. “Most of it will be from currency headwinds alone, and maybe another 40-50 bps from the changed demand scenario." Most currencies weakened against the dollar in the three months ended 30 September as investors sought the relative safety of the greenback amid Europe’s debt crisis. The dollar index, which tracks the currency’s performance against six major trading partners, rose 5.72% during the period. Infosys, which has the second highest weighting on the Sensex, fell 3.17% to ₹ 2,509.20 at close in Mumbai, ending a three-day, 6.2% advance. TCS dropped 2.26% to ₹ 1,041.20. The company is due to report earnings on 17 October. “Traders are buying protection amid uncertainty on the revenue outlook for the next two quarters," said Savio Shetty, a derivatives strategist at Prabhudas Lilladher Pvt. Ltd in Mumbai. A call option gives investors the right to buy a security at a set price by a specific date. A put option gives the right to sell. Investors use options to guard against fluctuations in the prices of securities they own, speculate on share-price moves, or bet that volatility will rise or fall. Jeanette Rodrigues and Ketaki Gokhale contributed to this story.